Who can’t pass up a chance to put the puck on the stick of someone that wears the same jersey as they do? We offer up a handful of players who are definitely on the ‘Nice List’ for this year’s Holiday Season. The 22-year-old Finnish winger has given the Avalanche a huge helping hand courtesy of a League-leading number of assists and points (56) in 2018-19. 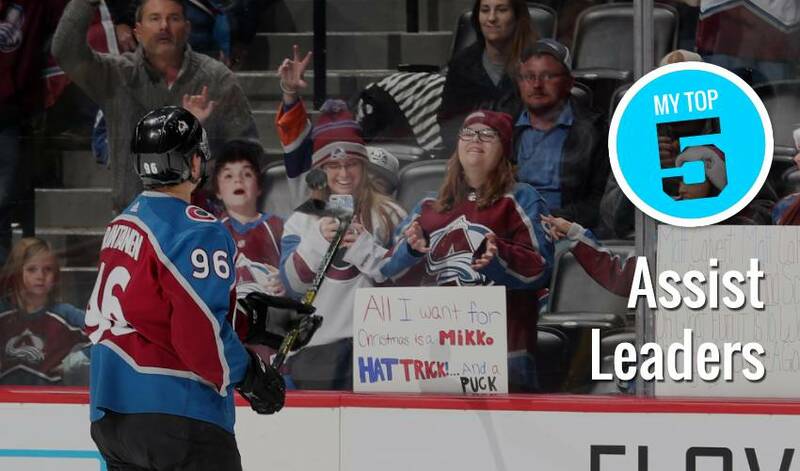 Drafted 10th overall in 2015, Rantanen racked up three assists (along with a goal) against Edmonton on December 11. The player with the ‘C’ on his jersey consistently gets an A+ for his set-up skills. Wheeler sits atop the standings when it comes to power-play assists, with 18. Last year, he tied with Claude Giroux for the No. 1 spot in helpers, tallying 68 assists in 81 games. Toronto’s top-rate centre has been more than a passing fancy this year. The slick-skating Marner’s penchant for perfect passes has helped the Maple Leafs ascend to near the top of the League standings this season. Whether it’s lighting the lamp – he has 14 goals so far – or setting up his teammates, Kucherov is once again at the top of his game in 2018-19. Thirteen of his helpers have come when Tampa Bay is on the man advantage. He’s the second Avs player to land on this week’s list, teaming with Mikko Rantanen to give Colorado a power-packed one-two offensive punch. MacKinnon, who sits second in overall scoring (53 points) to his teammate, has picked up 14 assists via the power-play. Blake Wheeler co-led the league with six assists as part of his seven-point week (1-6–7) which featured a career first.